UPDATE 2015 : click here for latest update about departure tax in New Zealand. The fee is scarped from most airports in New Zealand. In the last 3 years I have been on and off New Zealand for may be 10 times. I always had great time out there, but there is one thing which really annoys me every time I come to airport to catch my out bound flight from New Zealand. It is departure fee. 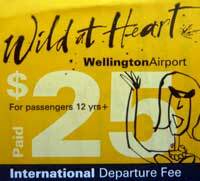 For all international departures you need to pay departure tax (currently it is 25$NZ). It looks a small charge comparing with amount of money you already spent in the country. That is the thing I can’t understand – they collect so much taxes from all tourist industry, as it is expensive country to travel, and it is still not enough and they just want to ruin all your wonderful experience about New Zealand. Small thing, but I am sure it will be remembered by most of tourists. Especially all whose long queues to pay that fee. Gladly at least in Auckland airport you don’t need to pay this fee, but keep 25$NZ in you pocket if you are flying out from any other airport in New Zealand. I agree with you, I think it is some kind of a corruption for the tourist, why would the government in such a beautiful country collect such tax! Not any more… been scrapped! Dean, as I mentioned it scrapped in Auckland only. You still need to pay international departure fee in other airports in New Zealand. Unfortunately the majority of the airports in the world, with few exceptions as Dubai Airport, charge for departing passengers. This is not a New Zealand thing, this is not a country thing. You would be surprised how much BAA charges in England for each different classes using their Heathrow Airport! As airports started becoming private BUSINESSES they started trying to find any and every way of generating revenue as governments started stepping out of the business as it originally was. So, for you information, Auckland never stopped charging for theirs or any other airport that does it. They just prove how naive passengers can be: they added to the airline ticket (see the famous battle between Air New Zealand and the airport fees). Then sheepishly people pay them but don’t notice. lol And don’t complain. Next time you buy a ticket, query the taxes you pay. Included (not in WLG and CHC and RAR etc cases) among government and airline fees, you will have your nicely airport departure fee. Sorry, a correction. For CHC, departure fees were also included in your airline ticket. Next step will be WLG, as far as I heard in time for the Rugby World Cup. I understand that fee didn’t just disappear but I prefer then this fee is included in ticket price and don’t need to pay in airport. Usually (at least myself) I don’t have local cash left. Plus you need to get earlier to airport to pay those fees at last minutes. That what annoys me most not the fee itself. .-= Vi´s last blog ..What is best time go to … =-. The fee at Auckland IS included in the ticket price, and currently it is NZ$14 for arrival and $14 for departure, so it is $3 cheaper to arrive and fly out of Christchurch or Wellington where there is no arrival charge. Personally I am always look to total price of ticket and usually flights to Auckland are cheaper comparing flights to WLG. Hi can anybody tell me what would happen if you turned up to the airport in Dunedin with no money as you have just lost your wallet and only have your passport. Just a thought i too just get really pissed off with paying this tax. I spend thousands on my trips to the south island and then get slugged 25 bucks at the airport. Check latest update on departure fees. Already at three airports in New Zealand departure tax is scrapped. Try flying out of Australia. Google NZ Departure Tax. I think you will find that all your worries about this last minute expense on leaving New Zealand no longer applies. It was never a Government thing anyway, rather an Airport and Airline thing really! Yes, in major NZ airports this fee is included in ticket price now, so we still pay it, but it is not such visible and doesn’t annoy so much. As traveler I really don’t care who’s thing is that. this fee is so sad and irritating. i vowed never to go back there after they forced me to draw cash and pay a $20 charge on my card to get their stupid departure fee. what a backward…rather visit australia.